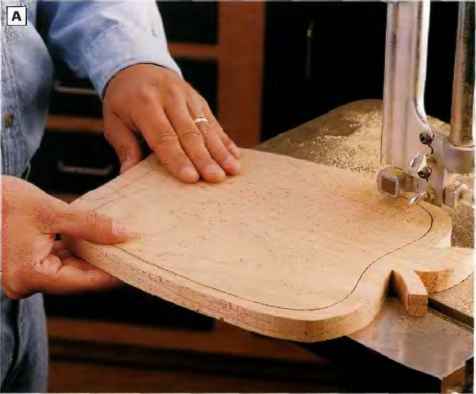 O Laminate the bases together: First, rip and crosscut the four base pieces to size, according to the Cutting List dimensions on page 128. Glue pairs of base pieces together to form two 1^2-in.-thick bases. 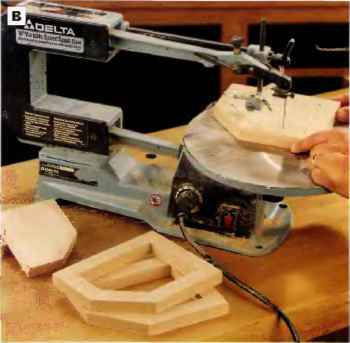 © Round over the top edges of each base assembly: Ease one end and two edges around the top face of each base assembly with a router and 1/4-in. roundover bit. © Bore the ballast holes in the bases (optional). Lay out the locations of the ballast holes on the liases, following the Bases drawing on page 129. Drill the 12 holes in each base with a lV'4-in. 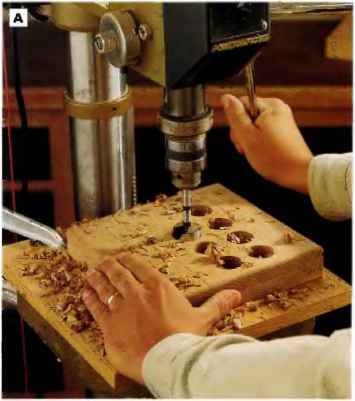 Forstner bit on the drill press (See Photo A). © Cut the eight frame pieces to size and shape: First, crosscut eight TV.s-in.-long blanks from your (>-in.-wide white oak board. 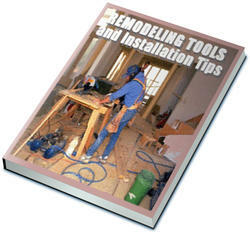 Lay out the frame shape (See the Frames & Divider drawing, page 129) onto one of the blanks, and cut out the frame piece. 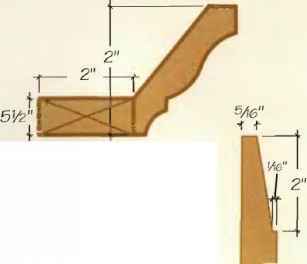 Remove the center cutout area by drilling relief holes at each of the cutout corners large enough for a scroll saw blade, then trim out the waste piece on the scroll saw. Clean up the cut (idges with a file and sandpaper'. 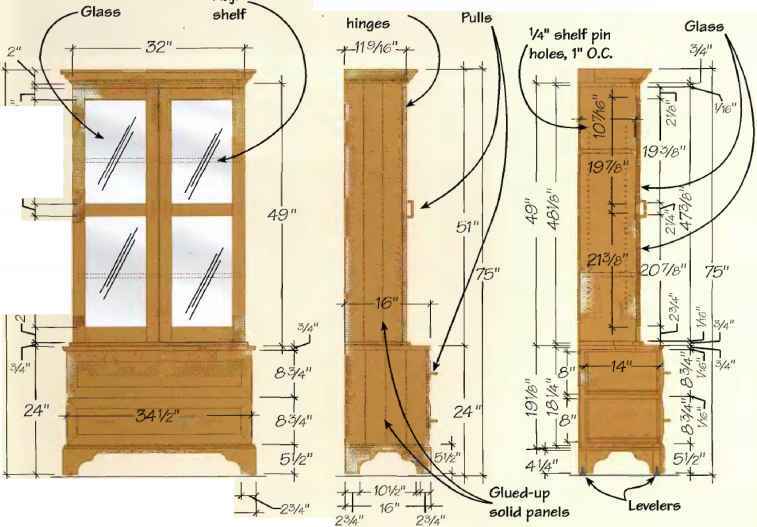 Use this frame piece as a pattern for tracing the shape on the other seven workpieces. Cut them all to shape (See Photo B). 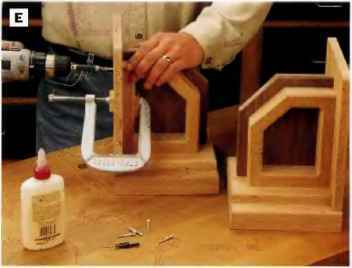 © Join the frames together and ease the edges: Glue and clamp pairs of frames together to form four frame assemblies. Be sure the edges and ends of the parts are flush. When the glue dries, rout around the cutout area on one face of each frame assembly with a piloted 45c chamfer bit set to a depth of 3/lfi in. Then ease the top end and angled and back edges of this chamfered face with a router and Vi-in. roundover bit. PHOTO A: (Optional) Drill three rows of l^ ln.-dla. holes Into the top face of both bases with a Forstner bit In the drill press. These holes will be filled with ballast and concealed by the base caps. PHOTO B: Lay out and cut one frame to shape on the scroll saw, then use this first frame piece as a pattern for tracing the shapes of the other seven frames. To remove the center cutout from each frame, drill relief holes at each corner of the cutout so you can turn the workplece on the scroll saw as you cut. PHOTO E: Position the front piates on top of the bases, ciamp them in piace and attach them to the frame/divider assemblies with glue and four lH-ln. flathead wood screws. 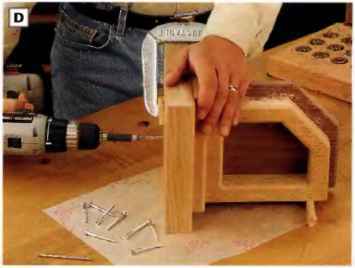 PHOTO C: Flatten the long edges and bottom ends of the frame/divider assemblies on the [Dinter or sander. The purpose here is to produce flat, even surfaces to attach to the base caps and front plates. PHOTO D: Attach the bases to the frame/base cap subassemblies with glue and countersunk 2-ln. wood screws. Ciamp and fasten the parts together carefully to keep from spilling the ballast. shape, trace its profile onto the second walnut blank and cut out the other divider. 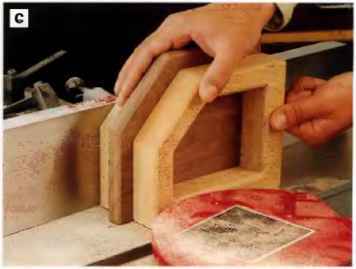 Rout the top ends and angled and back edges with the '/4-in. roundover bit. O Glue up the frames and dividers: Spread glue over the inside faces of two frame assemblies and sandwich them around a divider. Clamp up the pails, making sure the flat, square edges of the three parts are flush. Then flatten the flush edges and ends of both frame/divider assemblies on a jointer (See Photo C). You could also use a stationary sander. 0 Cut the two base caps to size, then round over one end and two edges of the top face of each cap with a router and H-in. roundover bit. O Make the front plates. Surface-plane an 8-in.-wide, 20%-in. oak blank down to % in. thick. Crosscut the blank in half to form the two front plates, and sand the parts smooth. © Fasten the base caps to the frame/dividers. Glue and screw a base cap to each frame/divider, so the flat end (without the roundover) of the base cap is flush with the long, flat edge of the frame/divider. Drive four countersunk lV^-in. wood screws up through the base caps to attach them to the frame/dividers. 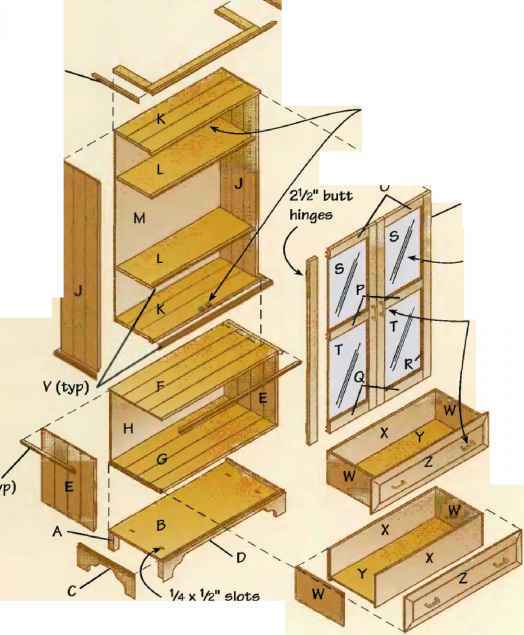 See the Base Cap drawing, page 129, for screw placement. © Install the bases. First, fill the ballast holes with weight (steel shot, sinkers, brads or short screws will all do the trick). Then glue and screw the bases to the base caps with four countersunk 2-in. flat-head wood screws (See Photo D). Note that the flat end of each base cap assembly is set back % in. from the flat end (without the roundover) of the bases to leave room for installing the front plate. © Fasten the front plates to the bookends with four countersunk lH-in. flathead wood screws and glue (See Photo E). © Break any remaining sharp edges with sandpaper and clean up residual glue squeeze-out. Apply three coats of clear polyurethane varnish. 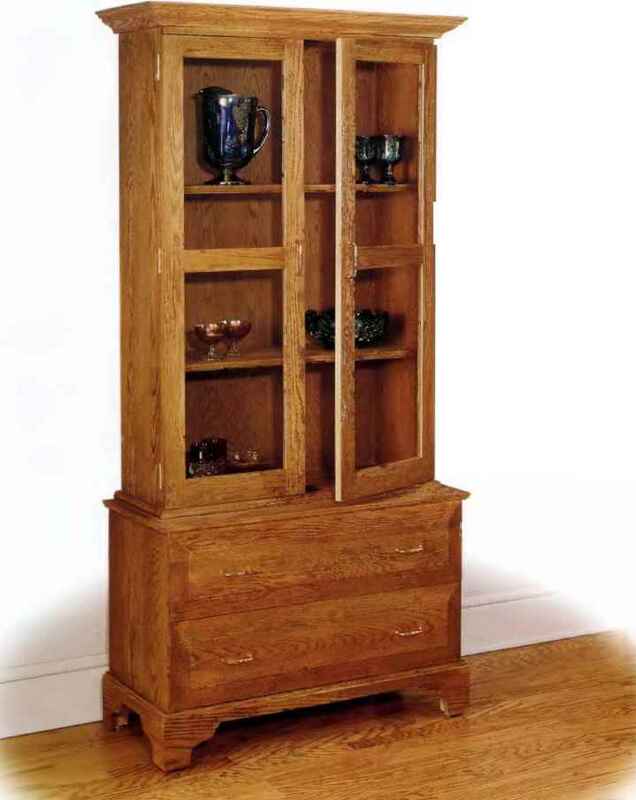 Store your best table linens and display your favorite china, glassware or curios in this handsome, efficient ' pair of stacked oak cabinets. 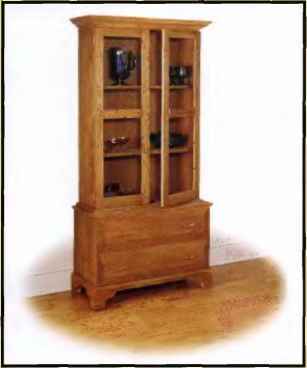 Constructed as two separate units, the upper and lower cabinets are attached together to form a hutch-style storage unit that's at home in a dining room, kitchen or even a living room. Va x 31 Vè x 48Ví¡ in. 3/4 X IVA x 474s in. fyÁ x 2Vfe x lme in. X 2V4 x 1 me in. % x 2M x 11Mb in. Vs x ll^Viö x 19% in. Vè x 111546 X 213^ in. Vi x 8 x 14 in. Vi? x 8 x 31 Vi in.